We hope you all had a great Thanksgiving weekend and had a chance to catch up and spend time with your family and loved ones. Our man with the mic Kenny Labbé went to Region Riot CX with Torch and even though he was off the clock, he still tweeted out pics of all the podiums. Congrats to everyone who raced and kept the engine running. Next up, the CCC finishes up with the grand finalé and Illinois State Championship at Montrose Harbor. Just like every year, let’s make a day of it. Come out early, stay late, and let’s finish up the series in style. Spidermonkey Cycling is continually adding information about #MontroseCX to its landing page, but look for the full race preview here on Thursday. Please help Rapha Chicago plan for the number pick-up party refreshments by RSVP’ing. Also note that you will not be able to register at the Rapha party, but still can on race day. But register online now to avoid the hassle! Parking spots at Montrose are going fast. We will try to accommodate paying for parking on race day, but guarantee a close spot by adding to your checkout when you register on BikeReg by Thursday night. At Montrose we’ll have George Armstrong taking rider portraits (for free). George was at the Intelligentsia Cup this summer and you can check out his work here. While the series will be over and the series overall winners will be determined on Sunday, we’re going to push the end of season awards party back until after the holidays (final date TBD). 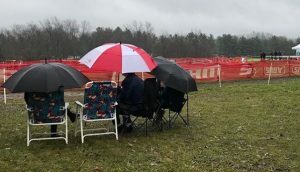 With USAC CX National Championships being held 12/11 – 12/16 in Louisville there just aren’t enough weekend hours to fit it all in before the holidays. We’ll look to have they party sometime in January, perhaps somewhere in the city. More details as soon as we figure them out. And finally… while the 2018 CCC series racing will be over after Sunday there’s still one very important (perhaps the MOST important) CX event… Afterglow – AlterNats! This year the event returns to Douglas Park Sunday on 12/9/18 and online pre-reg is now open. Be there! Grandpa always said, when life gives you lemons, make orange juice… or something like that. Without a ton of terrain to work with at Pheasant Run the South Chicago Wheelmen built a fun course and along with a “helping hand” from mother nature the weekend turned out to be one of the hardest of this year’s series. Thanks to everyone who came out to race and see the spectacle. Links to all the results you’re looking for are at the bottom of the page here. In the Overall Series Standings GoogleSheet riders in yellow have already secured their overall series titles by accumulating enough series points so they are >60 points ahead of the next placed rider, making it mathematically impossible to be caught. That being said, many categories are very, very, very, very close going into the final race, in some case less than 5 points separates the top 3 riders! So Montrose should be just as exciting as ever! But before we get to the last race, the series takes a quick pause to give thanks and spend some quality family time with the people we may or may not have seen since early September. So no matter how you celebrate Thanksgiving, please enjoy this coming weekend off the bike. If you’re in town and still want to keep the racing edge sharp, our Region Racing friends just over the border in Indiana are hosting Region Riot Cross on Sunday. Online pre-reg closes Friday. And then the week after the CCC returns and finishes up with 2018 Illinois State CX Championships presented by Rapha at Montrose Harbor in downtown Chicago. Plenty of details to discuss, but we’ll get to those next week. If you want brush up see the static race page here. Please RSVP for the Rapha number pickup party the day before the Illinois State Championship p/b Rapha Chicago and come to the race with your number already pinned! There will also beer beer and food, as well as 25% off the store for all pre-registered riders. And finally… Just a quick comment about poorly positioned bib numbers and long hair obscuring bib numbers. If One2Go and the USAC officials can’t see your number, at best it disrupts scoring and makes generating results longer, and at worst you don’t get scored and may get fined real, actual money. Please, please, please follow the example of a properly pinned number in One2Go’s pre-race email and please make sure to put that long hair in a pony tail. Thanks!!! A second year venue to the series Pheasant Run Resort (#PRRcx) is hosted by veteran race promoters, the South Chicago Wheelmen, one of the region’s and country’s oldest cycling clubs. Pheasant Run Resort located at 4051 E Main St. Saint Charles, IL 60174. Please don’t go to Indian Lakes. Preliminary staging for Saturday only will be posted here Friday morning. Saturday Results will affect Sunday staging. Preliminary Sunday staging will be posted here early Sunday morning. Please pay attention. New bib numbers each day. Please do NOT where your Saturday number on Sunday. NO coolers or grills allowed on the golf course, PRR has a restaurant and there are several others nearby. PRR has also asked us not to bring outside food or drink to the course or into the common areas of the hotel, so please be discreet if you’re bringing something. There is a gymnastics tournament taking place this weekend at the resort which will have a snack bar set up in the Mega Center lobby. Cash only (no credit cards), and the hours are 8AM-8PM Saturday, 8AM-6PM Sunday. After your race, if you’re staying at the hotel, please please please do NOT wash your bike in your room and do not take towels out of guest rooms to wash bike outside. There is some snow in the forecast for Saturday so please plan accordingly. NO walking or riding on putting greens or tee boxes. NO warming up on fairways. This is standard at any golf course CX event. This is another “No Drone Zone” due to the proximity to the DuPage airport. For guests staying overnight, checkout is at 11am on Sunday. Late checkout at 3pm is available for an extra $25. Kiddy Cross TBD this weekend depending on the weather. Parking is limited, satellite parking will be west across the street by Target (Kautz Road). Don’t forget the Ultimate PB&J Women’s Event Saturday afternoon in the Ultimate Pro Bikes tent. There will be even less daylight left at the end of the day than last week after the last race ends, so please plan accordingly. Also if you can, please help the South Chicago Wheelmen tear down the course (on Sunday) so they aren’t doing it all in the dark. The Course: Last year the course was on the West side of the property, but this year it is on the East side, next to the airport. Still very much a work in progress, but the SCW never disappoint and the track should roughly follow what’s below. As always, the course may be different and change based on weather conditions. Thanks to everyone who came out to race, cheer, and eat candy at a chilly yet sunny Wheeling Heritage CX. Links to all the results you’re looking for are at the bottom of the page here. Next up the CCC heads to Pheasant Run Resort in St. Charles, IL for the series’ only double race day weekend hosted by the South Chicago Wheelmen. There are 2 separate event pages on BikeReg (Saturday & Sunday), so please make sure you sign up for the correct day if you aren’t racing both days (although we’re not sure why you wouldn’t just race both days?!!?!). Online pre-reg will close at the regular time Thursday evening. Look for the course preview here on Thursday morning. If you’re planning to spend the night at Pheasant Run Resort, there are discounted room rates of $92 per night. Call Pheasant Run at 630-584-6330 and use code “cyclocross”. Also at PRR. We’re a little short staffed this Saturday and need help taking podium pictures for Twitter. If you have a mobile phone with a camera and can help out, please email us your podium pictures as soon as you take them. Thanks! There are only 3 races left in this year’s series, but still no one in any category has locked up their overall titles. That means the racing will be fast and exciting all the way until the State Championship at Montrose Harbor. Speaking of Montrose, the host club Spidermonkey Cycling just announced our friends over at the Rapha Chicago Clubhouse will be sponsoring the event and having a pre-race soiree at the clubhouse. Look for more details to come. If you’re not traveling for Thanksgiving, our friends just over the Indiana border are hosting Region Riot CX on 11/25/18 in Crown Point, IN. Details for USA Cycling’s CX National Championships in Louisville, KY are updated, and the Afterglow hosted by the Chicago Cuttin’ Crew is happening Sunday 12/9/18. Links to all these events and more are over on our Schedule page. And finally… another reminder the 2nd annual Women’s Networking Event hosted by UPB Juniors will be held Saturday 11/17/18 at 2:15pm in the UPB tent at Pheasant Run Resort. As part of this event, UPB will also hold the Ultimate Pro Racer Raffle to benefit a Women Cat 3/4/5 at Montrose. Proceeds will go towards the 2019 Juniors CX Camp. The raffle tickets will be on sale 9a – 12pm Saturday and Sunday as well as during the networking event. Warm drinks and treats at 2:15 pm on that Saturday. All women racers are welcome to come and visit. UPB’s juniors are hosting and will be mingling. This Sunday the CCC returns to Wheeling Heritage Park, hosted by the Northbrook Cycling Club. The Wheeling Park District welcomes us back for a day of cyclocross racing. And we are welcome back every other day we aren’t racing too. Check out the events and programs the park district offers throughout the year. Things like kids’ triathlons, free concerts, cultural events, camps, and sports galore. There’s even one called Wine and Yoga. It could be the greatest mashup to happen since cyclists started riding and running with their bicycles. Preliminary staging will be posted here. Electronic maps will get you closest to your destination by using 105 Community Boulevard, Wheeling. We shouldn’t have to repeat it, but DO NOT GO TO MELAS. Proceed beyond the pool building on the left to the west parking lot on the right. Please keep the angled parking lot closest to the Community Center open. Heritage Park is a no drone zone due to its proximity to the Chicago Executive Airport. The airport code is PWK for those of you trying to inspire a new tire tread with your racing prowess. The pavilion grass loves feet. It can’t stand bicycle tires and it really hates tents. Please don’t make the pavilion grass angry. It has a few picnic tables to share in its company. There are plenty of other open areas along the course for setting up tents. Food and drink. The park district food trailer will be back, taking center stage at the pavilion. No alcohol is allowed per park rules except for purchase. A variety of other food and beverage options will also be available. Weather. The forecast shows a little bit of orange covered by some grayish-white, but temperatures should be unseasonably cool. Okay, cold. Upper 30s, with moderate breezes. Okay, winds. Please monitor the forecast and dress appropriately for conditions. Warming up is sometimes hard to do, but there are paths to ride throughout the park. Many have lake views to make it easier and more enjoyable. As always, be mindful of pedestrians and other patrons of the park. The Community Center building is also open to us. Showers are available, but please do not bring bicycles into the building. Volunteers needed: Robert Paetsch is looking for a few volunteers to help with course set up, marshalling, and repair. Please email him if you’re interested. Volunteers race for free and have lunch provided. Sunday is Veterans Day. Thank you to all who have served in the United States Armed Forces. The Northbrook Bicycle Club would like to dedicate our day of racing in remembrance of George Garner, Sr. He served in the Marine Corps in the WWII era before opening his first bike shop in 1947 after the war. The course runs clockwise. Flat at the start until it transitions to the southwest corner of the park via the closed-off path, through the table top finish area, over to the course elevation for a couple ascents/descents before an off-camber run around the pool embankment to do it over again and again. There should be a short course option for the Juniors 9-14’s and Cat 4/5’s. Less elevation = more laps. Another great Groundhog PSI-clocross weekend hosted by PSIMET out in Woodstock. The Pre-Deju-Vu course on Saturday was more power while Sunday’s Groundhog course was more “finesse”, and more weather too. Links to all results and lap times are here. Next up, the CCC travels closer to Chicago with our Wheeling Heritage event. Due to construction in the park the course will be slightly different from last year, but still mostly the same. Look for the course preview Thursday morning and remember pre-reg closes Thursday evening. Speaking of Wheeling… The Northbrook Bicycle Club is looking for a few volunteers to help with course set up, marshaling, and repair Saturday and Sunday. Please email Robert Paetsch for details. Shifts are typically three hours or less. Volunteers may race for free and get food and beverage perks too. Also speaking of this coming weekend… unless you have a bike shop in your basement or garage, your CX bike probably needs some love. Get it into your local bike shop ASAP for a clean up, tune up, etc. before the wheels literally come off at the next race! Looking towards the end of the season we here at the CCC are thinking about changing up the when and where of the awards party. The time and location would have to be family friendly (i.e. not just at a bar) and at least mostly centrally located. If you have ideas or suggestions please email us at [email protected]. And finally… the 2nd annual Women’s Networking Event hosted by UPB Juniors will be held Saturday 11/17/18 at 2:15pm in the UPB tent at Pheasant Run Resort. As part of this event, UPB will also hold the Ultimate Pro Racer Raffle to benefit a Women Cat 3/4/5 at Montrose. Proceeds will go towards the 2019 Juniors CX Camp. The raffle tickets will be on sale 9a – 12pm Saturday and Sunday as well as during the networking event. Warm drinks and treats at 2:15 pm on that Saturday. All women racers are welcome to come and visit. UPB’s juniors are hosting and will be mingling.